From goodreads: Seventeen-year-old Grace grows up knowing she’s different, but she always attributed it to a mother who didn’t want her, a father who abandoned her, and a curse that sets her apart. Despite those struggles, her grandfather remained her rock and confidant. Her life irrevocably shatters the day her grandfather dies. “It wasn’t your fault,” Quentin said softly as he came up behind her, touching her briefly on the shoulder before lowering himself to sit on the edge of the coffee table. He leaned toward her, resting his elbows on his knees as he stared into her eyes, his expression conveying his compassion. Grace raised her tear-filled eyes. “It wouldn’t have happened if I wasn’t in the car with them.” Tears spilled over her lower lids, blurring her view of Emily’s picture glowing from the cell phone she still gripped. She heard every word Quentin spoke, but couldn’t cling to them like he intended. Every one of her friends could have died—because of her, not him. Visions of caskets and grieving families had her pulse quickening. Worry festered in the center of her chest—circling and tearing at her until what rose forth was anger. With every beat of her heart, the anger pulsed stronger. No. In her head, she said it again. No. The word ricocheted like a war cry through her cerebral cortex until it owned her, heart and soul. Energy channeled through every inch of her body. A shiver chased behind it. Those she cared for and loved would not pay for what she was. In that instant, Grace felt the power of her choice thunder through her like an electrical current. Just like Seth in the movie, she chose to be what she was meant to be, and not to shed what she originally thought was a burden. Newly determined, she leveled her gaze with Quentin’s. This is the story about a Chosen, one who is brave and fierce. One who has been kept in the dark and everything she once believed to be true, is not. One who will protect those she loves as well as Pandora’s Box. Did I entice you? 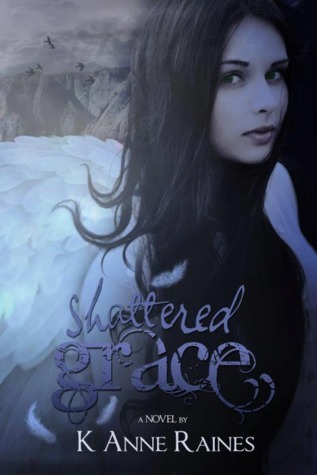 Who doesn’t love a book about angels, filled with suspense and a love triangle? K.A Raines has created a colorful story about the existence of the Chosen, specifically, Grace. Her world is literally turned upside down after the loss of her grandfather and the pain she feels is heartbreaking. But the loss isn’t the only thing that has rocked her world off its axis, it’s the news that Quentin, her Guardian is about to share with her. Growing up she always thought she was odd or even a freak but as the story progress we learn it’s a gift and not a curse. She’s able to sense emotions by simply touching someone whether it is for one second or a minute. With that ability brings a burden of knowing the truth even when you don’t want to. At times I thought the story slowed down too much and details that should have been an important were missed. With that being said, K. Anne Raines writing style is fantastic and the dialogue between all the different characters felt genuine and natural. I’m looking forward to what the next book in the series will bring and I hope it will involve more of Quentin!